In the midst of a royal-birth-dominated media week I found myself in my graduate class, interpreting two iconic Renaissance portraits with ermines in them. And thus a post was provoked. How did this little weasel get associated with royalty, pretentious nobility, and the academic and clerical hierarchy? 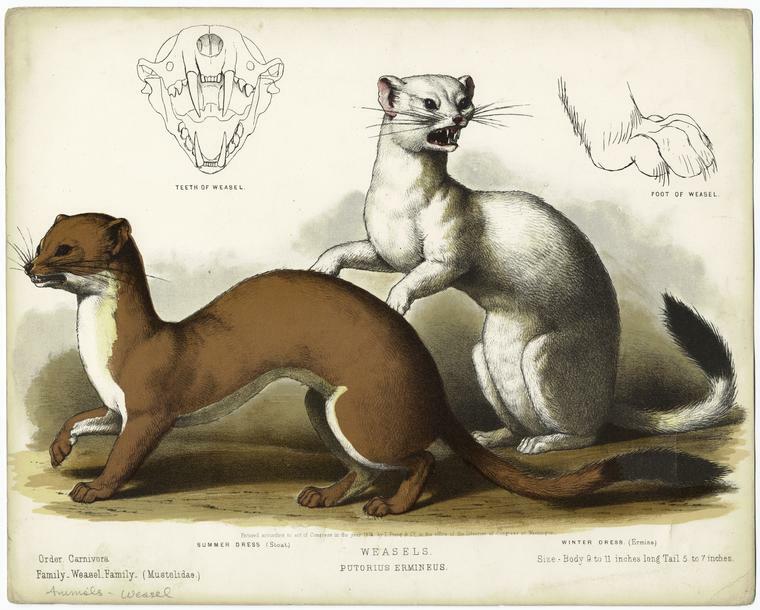 The answer lies in the (rare) white fur of this beast (more scientifically know as the stoat, or short-tailed weasel) as well as the emblems incorporated into what became a distinct ermine design: for no animal has the “ermine” black and white coat, it is a heraldic invention. Leonardo da Vinci, Lady with an Ermine (Cecilia Gallerani, the mistress of Ludovico Sforza, the Duke of Milan), 1489-90, The Czartoryski Museum and Library, Krakow; Nicholas Hilliard, The Ermine Portrait of Queen Elizabeth, 1585, Hatfield House. 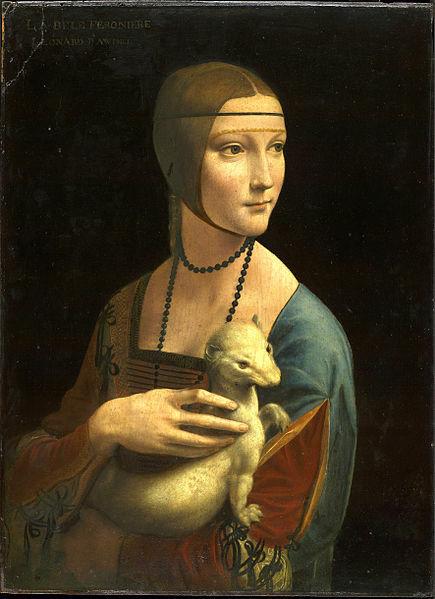 Leonardo has a real ermine in his portrait of a woman who is presumed to be Cecilia Gallerani, the mistress of his powerful patron Ludovico Sforza, the Duke of Milan–whose heraldic emblem was an ermine. 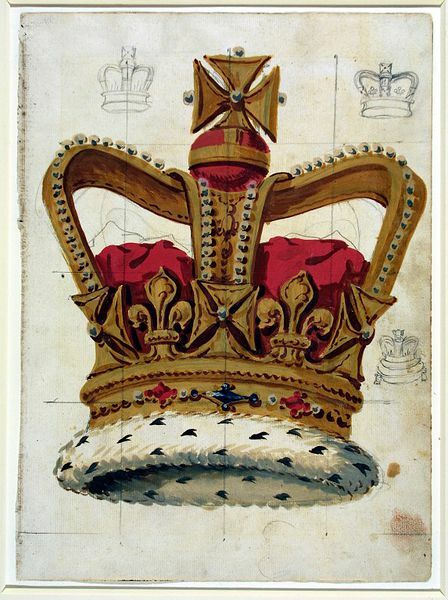 But the little creature on Elizabeth’s arm, wearing a crown collar, is an artistic creation based on the ermine pattern, in which the distinctive black tips of the animal’s (several animals actually) tail is stitched onto the fur, sometimes cut into distinct heraldic shapes. 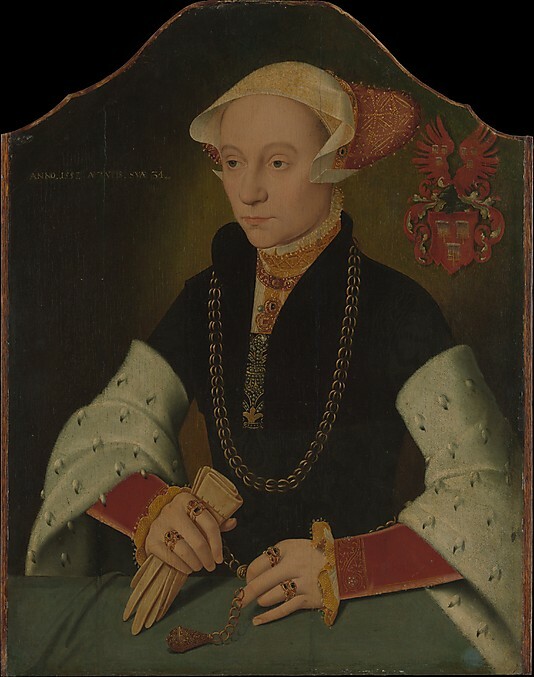 I think you can see this most clearly in the portrait below, in which a sixteen-century German merchant’s wife is wearing very distinct ermine sleeves (and a lot of jewelry) with her family crest in the corner. Bathel Bruyn the Younger, Portrait of Woman of the Slosgin Family of Cologne, 1557, The Metropolitan Museum of Art, New York. 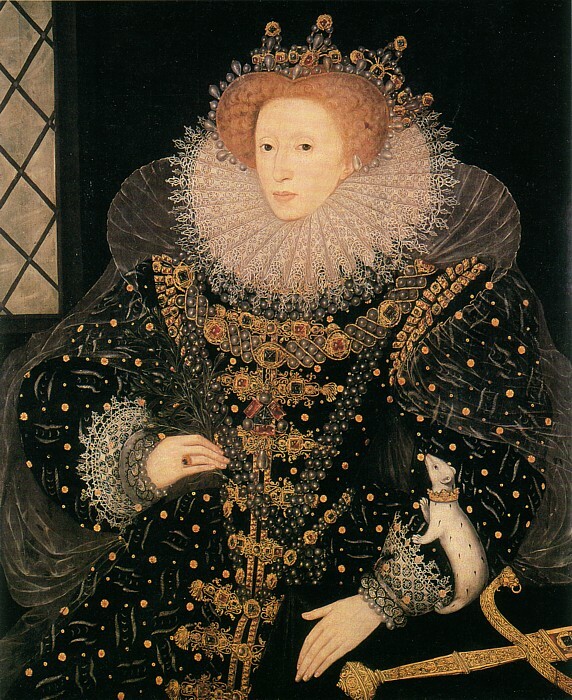 As eminent (and wealthy) as she might have been, this woman is not a Queen–or even the mistress of a Duke: it seems like anyone can wear ermine in the sixteenth century, at least outside of England. 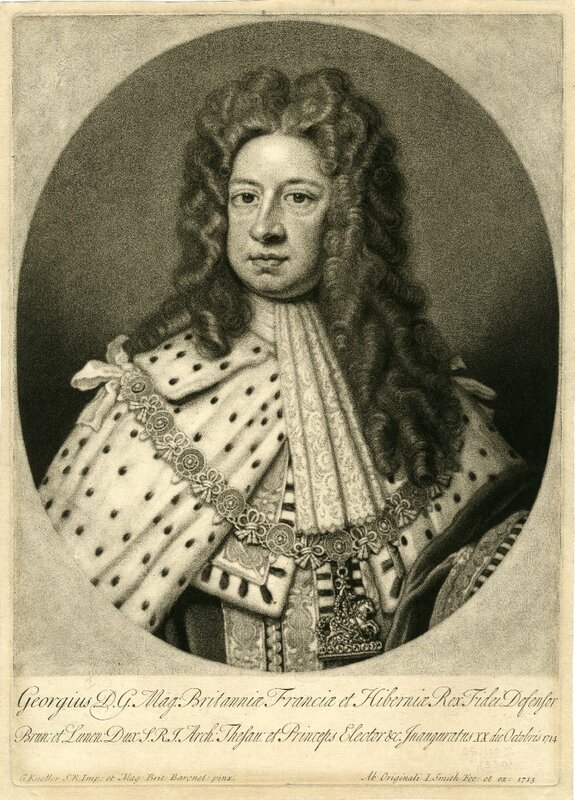 The black-and-white (or white-and-black) patterned “fur” had become a device of conspicuous consumption and social mobility, because of its long-held associations with majesty, wealth, and a Christ-like “purity bought with his own death”, in which it was said that the ermine would give himself up to the approaching hunter, so not to sully his pure white winter coat (not quite sure why this was royal). The sheer expense of ermine is most likely the ultimate source of its desire and association with the wealthy and privileged: the stoat’s coat is pure white only in winter, and then there are all those little black tails. I do think ermine maintains its exclusive association with royalty longer in England than on the Continent, but I could be wrong. 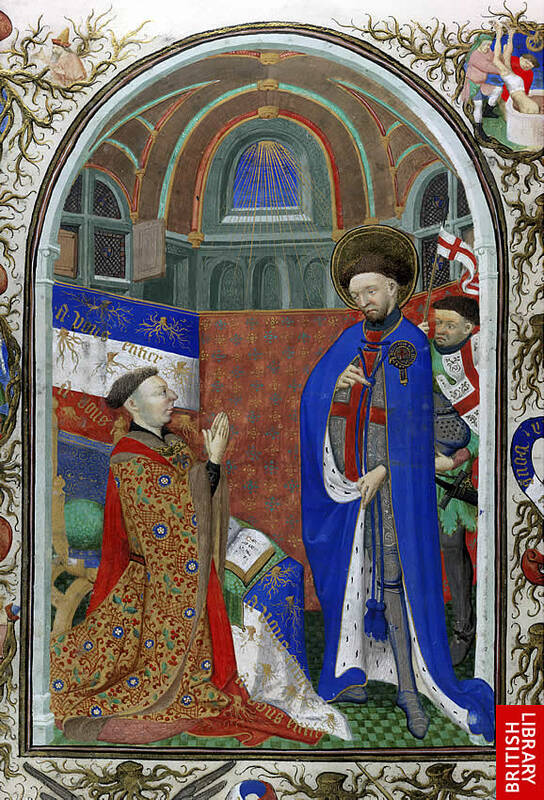 Ermine in various incarnations, through the ages: The Duke of Bedford prays before St. George in his ermine-lined robe, c 1423, the Bedford Hours, 1423 (Additional Ms. 18850 ), British Library, Mezzotint of King George I by John Smith, 1715, British Museum; Drawing for a sign for the Crown Inn, c. 1750, Victoria & Albert Museum, London; The Stout wearing his summer and winter coats, Prang & Co., 1878, New York Public Library Digital Gallery. Appendix: as a stark contrast to Leonardo’s portrait, I could not resist adding this Ermine with a Lady “portrait” by Ellen Paquette! This entry was posted on Saturday, July 27th, 2013 at 8:22 am	and tagged with Animals, Art, England, Etsy, Flora and Fauna, folklore, Leonardo Da Vinci, Renaissance and posted in Culture, Design, History. You can follow any responses to this entry through the RSS 2.0 feed. The fur always looks best on its original owner! Thanks for the reminder. Interesting! Love the last picture, too funny. I believe ermines were mentioned in Froissart’s Chronicles ? No doubt! He was “covering” some very eminent, ermine-wearing figures. A copy of Leonardo’s lady adorns one of my walls quite magnificently! !